Our PMS (Project Management Software) is a digital tool; which will help you to unite with your team in order to achieve your goals in time that too, after proper utilisation of your resources and within the desired cost. Allen’s PMS offers you the features like: distribution of tasks, time tracking, budget control, planning of the resources, combining teams to deliver them the tasks and many more. After using our software you will realize, that your business is running in a systematic way and all your tasks are completed within time, as you will be able to take timely decisions. Apart from these benefits, you will be able to manage the complex projects. Finishing such projects is a huge task in itself as, you don’t want it; to go beyond due date, to go over the estimated budget and to get lower returns on investment. To complete these critical tasks, you need comprehensive project management software and we are providing you the same. 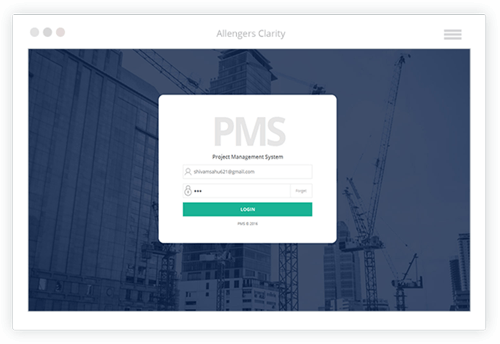 Allen’s PMS will support you to complete the projects within deadlines by tracking the time, estimating and notifying you the completion date, identifying the deviations (if any), at each phase of the project. With these numerous features and benefits, the software is not at all complex, rather is easy to use and understand and most importantly, our technical and support team is always ready for your help at any stage.